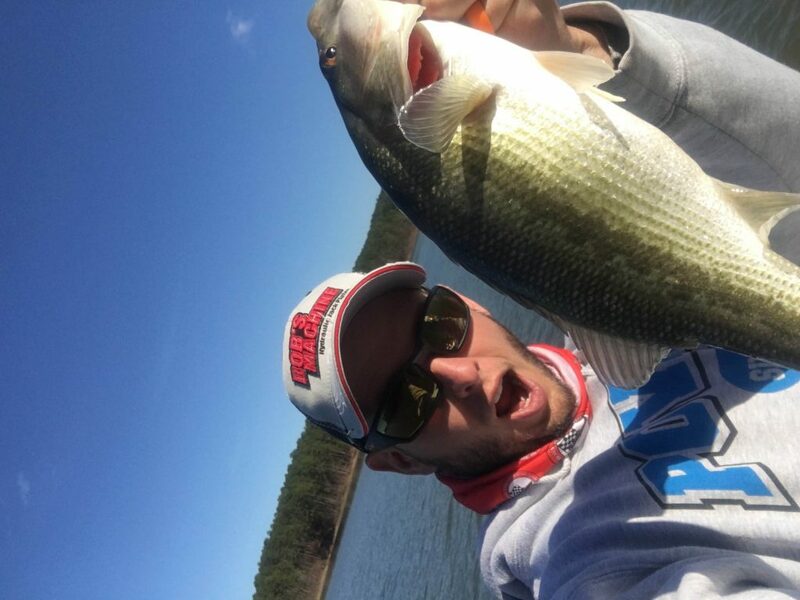 Arkansas is unique in that it offers all types of different fishing. From crystal clear waters at Greers Ferry and Ouachita, to muddy and grass fisheries like the Arkansas River. Having many different options mean one thing….the fish will be biting somewhere!! Most trips will be on the Arkansas River from Little Rock to Conway (pools 6,7,8), Lake Maumelle, Lake Beaverfork, and Lake Brewer. We can also go to Dardanelle, Greers Ferry, or Lake Ouachita if you would like to make a special trip. If you have someone that wants to fish, but isn’t that great at casting….NO WORRIES! I have options for us to still get them catching fish. I will meet you at the ramp (hotel pick-up can be arranged) with the boat already in the water ready to go. All tackle, bait, life jackets, etc will be provided for up to two people. Licenses will not be provided unfortuantely. We will go after the species that is biting the best at that time, unless you have a specific fish in mind that you want to catch. I usually try to be on the water several day a week in order to stay on the fish. This way we spend more time catching and less time trying to ‘find’ them. No matter what I can promise that no one wants you to catch them more than I do. We will do whatever it takes to catch fish! NO FISH, NO PAY! We will most likely use a combination of both artificial and live bait throughout the day. After the trip is over, I am more than happy to filet your catch and bag them if you would like. Simply bring an ice chest (hopefully a really big one!!!). 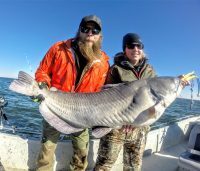 Lake Tawakoni is the Catfish Capital of Texas and Guide James Evans knows where to find Trophy Blue Catfish all winter long. Lake Tawakoni Fishing Guide James Evans has over 15 years of experience putting Trophy Blue Catfish in the net. We never put our boat up and chase Striped Bass, White Bass, and Hybrid Striper all summer long. Book your trip today! 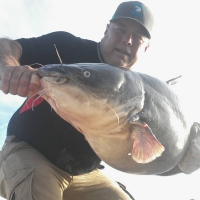 Over 15 years of Catfishing experience on Lake Tawakoni and making anglers smile with Big Blue Catfish! Lake Tawakoni Fishing Guide Tony Pennebaker targets Blue Catfish from November to March and puts big fish in the net! Lake Tawakoni Catfish Guide Tony Pennebaker targets channel catfish and flathead catfish in the spring and summer, and will take a few Crappie and Largemouth Bass Trips too! Come fish the Catfish Capital of Texas with Lake Tawakoni Fishing Guide Tony Pennebaker! Steven Paul is owner and operator of Tennessee Musky Fishing. This is the premier musky chart on Melton Hill and many other waters in Tennessee. Wes Campbell is the owner of bendarodfishing.com a fishing charter service on Lake Lewisville, Lake Ray Roberts, and Lake Tawakoni. We fish out of a 24 foot Kenner Boat with all the latest and greatest depth finders, trolling motors, and rods and reels! We target Hybrid Striper and White Bass year round and put big fish in the net! Thank you for stopping by! My name is Capt. Stephen Andre’ and I own and operate Lake Texoma Striper Hunter Guide Service in Grayson County Texas on beautiful Lake Texoma. 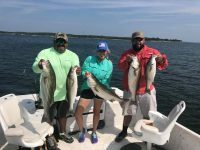 I specialize in lure fishing for Striped Bass (also known as Stripers) on Lake Texoma and will teach you how to as well….I grew up fishing artificial lures, so that’s the way I catch them! I caught my first fish at the age of 3 years and have been fishing ever since. I spent the first 8 years of my life in Louisiana fishing in the bays, backwaters, and Gulf of Mexico. My parents moved to Dallas in 1978 and I caught my first Sand Bass, Hybrid Striped Bass and Striper on Lake Ray Hubbard. I DO NOT USE LIVE BAIT! I am a true to heart artificial lure fisherman and have been most of my life. I get much more satisfaction tricking those fish with an artificial lure. Fishing with artificial lures allows us to fish from very shallow water to very deep water and gives us the opportunity to move around and chase fish and see the lake and the natural surroundings. Artificial lures catch big fish! Cast out, set the hook and hang on!! Coy Devoll owner-operator of Texoma Striper Kings and TexomaStriper.Guide has over 15 years of experience! Lake Texoma is the Striper Capital of the USA and Coy Devoll will show why this reservoir is famous! We target Striped Bass and White Bass year round with artificial lures only! Sorry, no live-bait fish for us! If you like throwing Alabama Rigs, Swimbaits, and dropping vertical jigs or slab spoons, give us a call! Lake Texoma is a numbers Striper Fishery with trophy ten plus pounders mixed in! Come enjoy the Catfish Capital of Texas with the Best Lake Tawakoni Fishing Guide, Andrew Taylor today! We are the Premier Multispecies Fishing Guide on Lake Tawakoni since 2010! We target Trophy Blue Catfish from November to March, then turn our attention to Striper, White Bass, and Hybrid Striper! Lake Tawakoni Fishing great 365 days of the year, come join us! Lake Tawakoni Fishing Guide Cliff Thornton targets Striper and White Bass year round on this East Texas impoundment. Tawakoni Striper Guide Cliff Thornton puts trophy Striped Bass in the net! A full-time Lake Tawakoni Fishing Guide, Mickey Casey targets Trophy Blue Catfish from November to March and Striped Bass all year long. We catch Striper and White Bass on live bait and artificial lures. Book your Trophy Blue Catfish Trip today with the BEST Lake Tawakoni Fishing Guide-Mickey Casey! The premier Artificial Lure Striper Guide on Lake Texoma since 2001. We use artificial lures only to target White Bass and Striper on Lake Texoma year round. 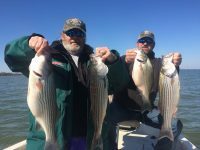 Lake Texoma Fishing Guide John Blasingame owner-operator of Adventure Texoma Outdoors for more then 20 years still enjoys catching Striper with Clients, and sharing this great lake. 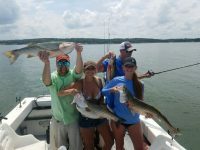 Voted best Lake Texoma fishing Guide for 2018 by the Herald Democrate, we work very hard to make sure your Adventure is the BEST! We are one of the few Lake Texoma Striper Guides who uses only artificial lures to catch our limit. Come join us winter, spring, summer, or fall! We never put the boat up and catch Lake Texoma Trophy Striped Bass year round! Steve Buckley, the Premier Lake Texoma Fishing Guide since 2002 will put you and yours on quality Striper and White Bass year round! Our peak months are May and June in the summer and October in the fall. We can fish live-bait or artificial lures. Come fish the Striper Capital of the World with Guide Steve Buckley. 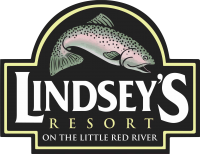 Lindsey’s Resort in the Ozarks on the Little Red River has been serving families and groups for more than 50 years. You’ll come for the fishing and stay for the fun – with rustic log cabins and camping, the Pot O’ Gold Restaurant and nearby attractions like Greers Ferry Lake, several great golf courses, the Ozark Folk Center and more. Lindsey’s Resort maintains a unique charm: Ozarks solitude combined with great outdoor activities. Here is a tranquil Arkansas vacation where the only sounds you’ll hear are the ones coming from the birds and fishing lines being cast into Little Red River. Surrounded by nature and all that it offers you, such as hiking nature trails and SCUBA diving in Greers Ferry Lake, this is an Ozark getaway that you’ll remember for years. At Lindsey’s Resort, you will find cozy log cabins, a campground for a more rugged-style outdoor experience and new riverside vacation homes. Our conference center holds up to 150 people and our Pot O’Gold restaurant offers catering. Combine the best of Ozarks nature with comfortable, charming lodging and you’ll find yourself at Lindsey’s Resort – Home of the World-Record German Brown Trout! Lake Okeechobee is a breathtaking 750 square mile natural lake that is located in South Central Florida. Okeechobee historically is one of the best Bass fishing lakes in the World. We value our clients, and want them to enjoy the best fishing trip of their life each time we fish together. We have the highest rate of repeat business on Lake Okeechobee for a reason! We catch big bass and lots of them! Our clients become friends and come back! Captain Michael Shellen is a full time resident of Okeechobee Florida and has been fishing Lake Okeechobee since 1979. Michael is President of the Lake Okeechobee Guide Association and is licensed by the United States Coast Guard. Captain Mike fishes from a Ranger 521VX equipped with a 225 hp Mercury Optimax motor. Mike’s boat is equipped with all the latest technology including: + a Minn-Kota 101 Trolling Motor that is whisper quiet to move you silently into position to catch a big bass, + a Lowrance GPS in the dash and a Lowrance Sonar unit on the bow, + ample storage to keep all your gear below deck + and a built-in cooler to keep your lunch and beverages cold. Captain Mike is also an outdoor writer with weekly columns featured in Scripps Treasure Coast Newspapers and the “Penny Saver Magazine”. Mike also writes a monthly column for “Outdoor Florida Magazine”, “Woods ‘N’ Water Magazine”, “Coastal Angler Magazine” and “Okeechobee Magazine”. And, Captain Mikes fishing reports are features on Fishin.com and Okeechobee360.com. Captain Nathan Shellen is a second generation Okeechobee fishing guide, and has fished Lake Okeechobee since he was a young boy. This valuable experience and time on the water has enabled Nate to develop valuable knowledge regarding the seasonal patterns of the bass and how to best catch them. Nathan is the future of Shellen Guide Service and has quickly developed a loyal clientele. His innate ability to find fish for his clients to catch, has earned him the title of Okeechobee’s top young guide. Aside from fishing Nathan is a Christian and a family man. Spending his spare time with his wife Kristi and his children Emma and Ethan. Fishing holidays with a difference! We pride ourselves on providing a special and unique experience. Taking our guests through the distinctive landscape of the West coast of Scotland. Throughout the trip we assist you with setting up, casting out and landing fishing. Taking you to little known locations with mountains towering over, endless sea views, wildlife all around and most importantly, away from the madding crowds. Each trip is always unique, with no two days fishing being the same and a large variety of species, you never know what you’ll land next. The offer of night sessions, which tend to produce the larger fish, is also there for those looking to land a monster. Blue Mesa Fishing welcomes you to your source for guided fishing trips in Gunnison Colorado. Blue Mesa Reservoir is home to many species of fish and offers Wild Kokanee Salmon fishing, Lake trout fishing, ice fishing, fly fishing and trophy trout fishing. Contact Blue mesa fishing today to book or customize a Lake Fishing or River Fishing trip fishing with one our fishing guides on Blue Mesa Reservoir or the Gunnison River. Blue Mesa is located in one of Colorado’s most beautiful national parks, located only a few hours from Denver, Colorado and just twenty minutes from Gunnison. Blue Mesa is an incredible place to spend one of your Colorado Mountain Vacations fishing, hiking, biking or camping! 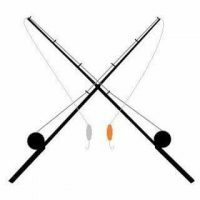 At Blue Mesa Fishing, we supply all the fishing tackle you will need for any lake fishing trip or fly fishing river trip. Let Blue Mesa Fishing be your specialists for guided fishing trips and an experience you will never forget on Colorado’s largest body of water. Blue Mesa Fishing is your premier Gunnison and Crested Butte fishing guide! 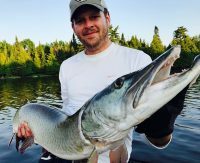 Minnesota Fishing Guide Service Guarantees YOU Catch Fish! And Yes, That Means Catching Minnesota Walleyes in July and August! 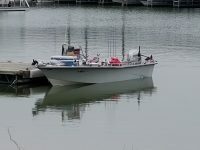 Trips Includes: Comfortable Boat, Fresh Bait, Quality Equipment…Everything needed to catch fish! Lake Seminole fishing is known around the world for the Largemouth Bass that can be found throughout the lake. 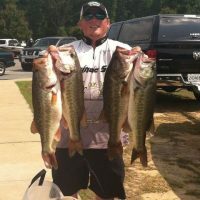 Visit Lakeseminole.com to book your professional fishing guide today! Fishing The Rogue specializes in year-round, professionally guided fishing trips for king salmon and steelhead on the Rogue river, the Umpqua and the rivers of the southern Oregon coast. Our all-inclusive trips are great for all ages and skill levels. We offer: full and half-day trips with experienced local guides, heated drift boats, all fishing gear, snacks and drinks and personalized instruction. 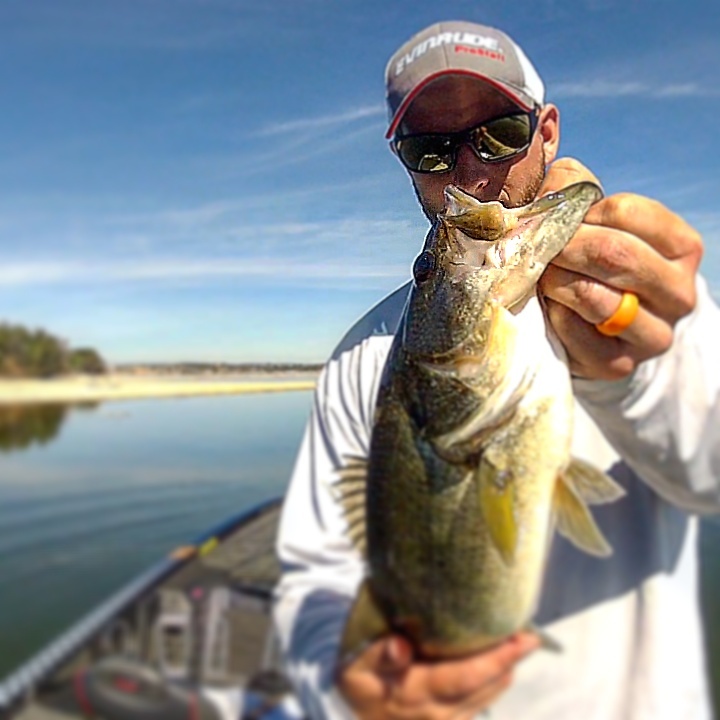 Lake Seminole fishing guide Matt Baty is an ideal example of what a fishing guide can do for novice and professional anglers. Lake Seminole vacation rentals are beginning to team up with people like Matt to provide fishing guide services to their guests.